← Don’t you worry that it’s not safe to ride a bike with your kids? We’ve had the Bullitt for a week now. Riding an assisted Bullitt in Portland was mostly effortless. 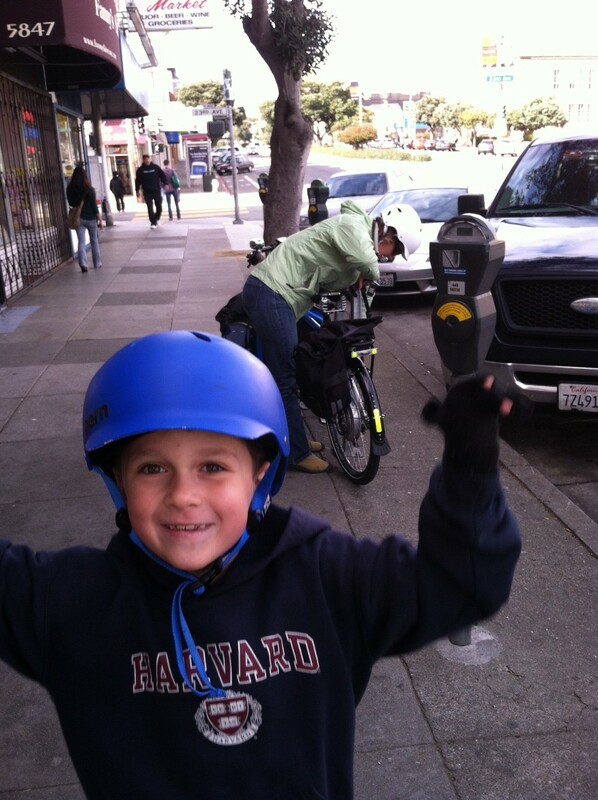 Riding an assisted Bullitt in San Francisco is not effortless. 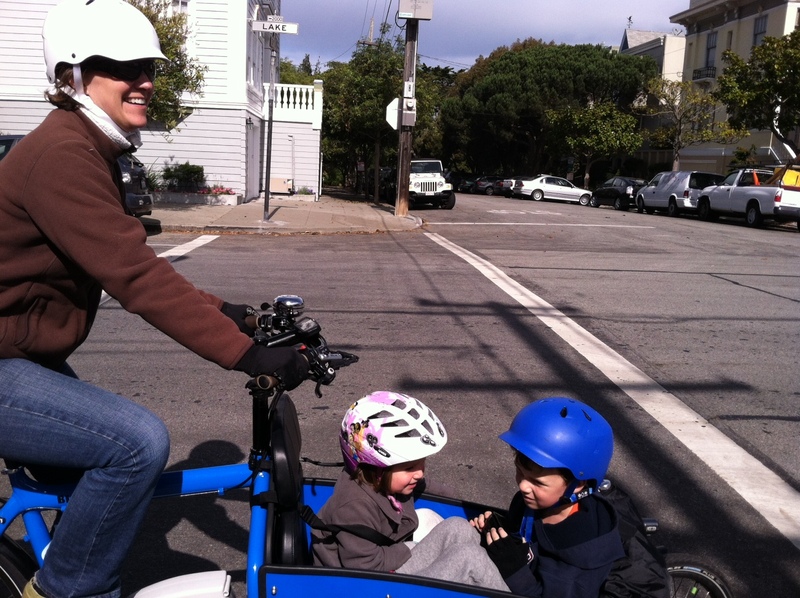 I’ve now got two kids and cargo on my bike most of the time and on serious hills, even with a boost from the BionX it’s: “Oh hello, lactic acid.” In San Francisco, riding a loaded, assisted cargo bike on steep hills is the parental equivalent of training for the Olympics, difficult but gratifying. I’m not yet up to carrying this kind of load every day. However with Matt at home for a month or so, I have time to build up strength by switching out to an alternate bike sometimes with just one kid on board. But it sure is fun on the days that we do take the Bullitt. And on the flats we are so freaking fast. We had an unexpected chance to race a car this weekend. Matt’s parents came to meet us for dim sum, then wanted to go shopping with us in the Presidio, then came home to play with the kids. They drove over from Berkeley. We met them at the restaurant; they arrived late because although miraculously they found parking immediately, they had to walk over from their car. When we left the Outer Richmond, we headed off separately to the Presidio. Ultimately we leapfrogged with them through light Sunday traffic. We all got lost thanks to the road construction, but ended up turning into the parking lot at the exact same time. Then we split up and headed home. I assumed they’d get there first because we had to climb both the Presidio hill and Mt. Sutro, but once again, we arrived simultaneously. On a weekday (or a busier weekend), with more traffic on the streets, we would have beaten them handily. I’m still not used to the attention that we get on the Bullitt. After several rounds of my son singing “99 Bottles of Beer on the Wall” I caved and bought a speaker that works with my phone. So now I am whizzing around the city with two kids on board who are blasting TMBG’s “Alphabet of Nations” and dancing along in the box. We are a traveling party-bike. Passing drivers stare so long that they drift out of their lanes as they go by. We hear groans of envy from parents pushing heavy strollers up San Francisco hills. Little kids chase our bike. It is a blast, but disconcerting. “AWESOME BIKE!” is what we hear most often. “Wow, all of us could fit in that bike,” is an occasional addition from groups of people waiting at bus stops. I expected that the Bullitt would substitute for trips that we normally took using City Carshare. Historically that’s meant shopping trips on the far side of a big hill or two that we couldn’t manage with two kids and cargo simultaneously, or trips out of the city. Realistically, we could have used City Carshare for all of the trips that the Bullitt is now handling indefinitely. Our occasional car rentals are usually pretty cheap, maybe $6-$20 per trip depending on length, and even at a once a week pace, it would be a very long time before the bike paid for itself using offsets from car share rentals. But the bike is more convenient. We no longer have to worry about when we go someplace; we’re not going to get stuck in traffic and we won’t have to circle to find parking. And it is so much fun to ride! One week in, when given the choice between City Carshare and the Bullitt, we all run to the bike. I think I might need to stop reading your Bullitt posts, too much drool on the keyboard isn’t good. Kidding! I love that you’re loving the bike. It’s true that it might not be the right decision just based on the money alone but the joy and the freedom it brings throw it up to the top anyway. Larry v Harry will send you many heartfelt kisses for this, I am sure.